In Match 9 of VIVO Indian Premier League 2019 (IPL 2019), KL Rahul played the role of a sheet anchor to perfection as Kings XI Punjab (KXIP) returned to winning ways with a comfortable eight-wicket victory over Mumbai Indians (MI) at PCA IS Bindra Stadium in Mohali on Saturday. The talented Rahul was unbeaten on 71 off 57 balls with KXIP reaching the 177-run target in only 18.4 overs. 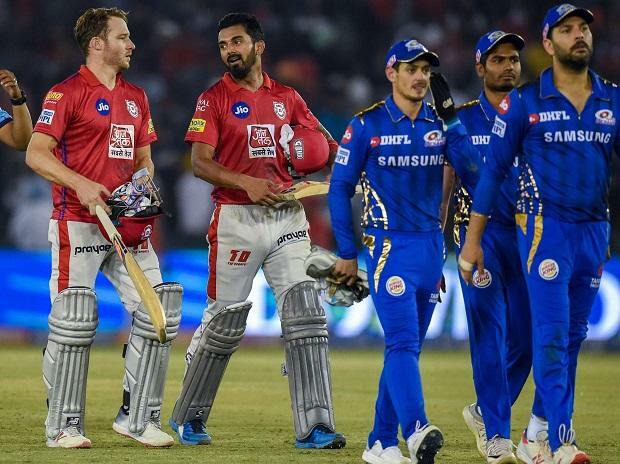 This was KXIP's second win in three games while MI lost their second game. The India international hit six fours and a six but what stood out was the manner in which he paced his innings. He played second fiddle to perfection till the dashing Chris Gayle and the flamboyant Mayank Agarwal were at the crease but upped the ante when it was required. The 15th over bowled by Hardik Pandya swung the match decisively in KXIP's favour with 19 runs coming off it. Once the pressure was off, Rahul hit the ever-dependable Jasprit Bumrah for successive fours to literally close the match. Gayle (40, 24 balls) batted in a manner only he can as he cleared his front leg and hit those towering sixes before Pandya brothers joined hands to send him back to the dug-out after an opening stand of 53. Gayle failed to get required elevation off a Krunal delivery and Hardik caught him in the deep. Rahul was barely into double figures when Gayle got out. The next partnership was equally interesting as Agarwal (43, 21 balls) was in great nick during the 64 runs that he added with his close buddy Rahul in only 6.1 overs. Pandya brothers had a dismal day with the ball as Krunal gave away 43 runs in his four overs and Hardik 39 runs in three overs. Quinton de Kock with a 39-ball-60 created a platform which the middle-order unfortunately didn't make full use of before Hardik smashed 31 off 19 balls to enable MI get past 175-run mark. While De Kock hit six boundaries and two sixes in his innings, Pandya hit three boundaries and a six off Mohammed Shami. For the home team, it was the lesser known Ashwin -- Murugan, who emerged as the most successful bowler with figures of 2 for 25 from his four overs. Skipper Ravichandran Ashwin didn't get any wickets but gave away only 26 runs in his four overs. The pace troika of Shami (2/40 in 4 overs), Andrew Tye (1/40 in 4 overs) and Hardus Viljoen (2/40 in 4 overs) were among wickets but bowled a lot of loose deliveries, giving away 13 fours and three sixes. In the fifth over, Rohit hit Andrew Tye for three more fours but Viljoen dismissed him in the very next over when he tried to play across the line. Suryakumar Yadav (11) was caught plumb in-front by Murugan but De Kock found his ways to get boundaries off both the Ashwins. For a good measure he pulled Shami for a six behind square and brought up his fifty with a boundary off Murugan. In between Yuvraj Singh became Murugan's second victim and once De Kock was trapped leg before by Shami, MI were in a spot of bother.